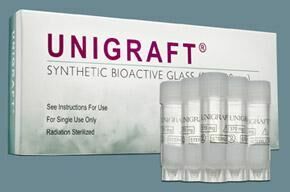 Unigraft is made of the highest quality bioactive glass by a proprietary process. The synthetic bioactive granules are optimally sized for ease of administration and enhancement of tissue growth. The product is conveniently packaged in a sterile vial, which is stored within a hermetically sealed foil pouch to ensure product sterility prior to implantation. Unigraft not only offers an osteo-genic framework for new bone growth, but also bolsters a higher level of osteoblastic activity to enhance bone regeneration. FDA has cleared this product for use in treating periodontal defects, extractions sites, cranial and facial augmentation and augmentation of the alveolar ridges.